Will food prices continue to rise, destabilizing the third world? A look at the ENSO. Summary: Riots around the world in 2008 and this year show the effect of rising food prices. There are many drivers of prices — increasing consumption, under-investment, pests/disease, weather. And despite the propaganda, cool cycles usually cause more harm than warm cycles. In this series we examine two wild cards, potential causing years of cool weather. Today: decadal climate cycles. Tomorrow: solar cycles. At the end of this post are links to more information about the emerging food crisis and global climate cycles. 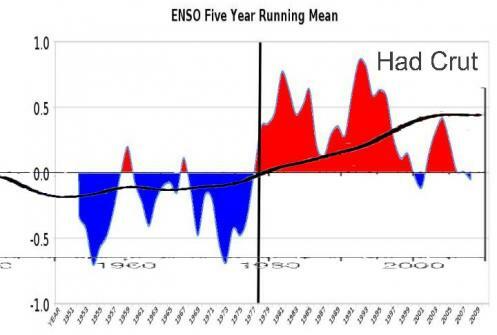 What is the ENSO and why is it is important? Among the two wild cards that might destabilize the world, two are widely underestimated: the normal decadal cyles (e.g., ENSO) and sunspot cycles. It is too soon for reliable forecasts, but there is evidence that either or both might reduce global crops during the next decade — especially in climatically marginal areas like Russia and Canada — and thereby boost food prices. Given the high weight of food in emerging market CPI baskets (one-third to half), this could destabilize many poor nations. 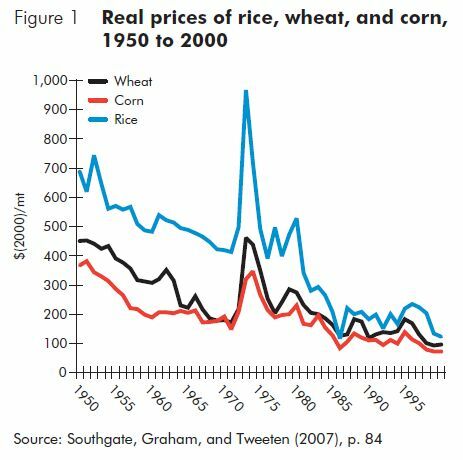 The riots following the 2008 food price spike were just a sample of what might happen after a several years of rising prices. Imagine what a repeat of the 1970’s cooling would do. (2) What is the ENSO and why is it is important? Periods dominated by El Nino tend to warming. Periods dominated by La Nina events (such as the 1970’s global cooling scare and the La Nina in progress now) tend to cooling — as shown in the below graph from Steve Goddard’s website. “Had Crut” is the global temperature index of the UK Hadley Centre for Climate Change. The red/blue areas show the anomaly (current vs. average) sea surface temperatures (SST) in the Pacific as measured by the ONI. Today we are experiencing the effects of a strong La Nina. 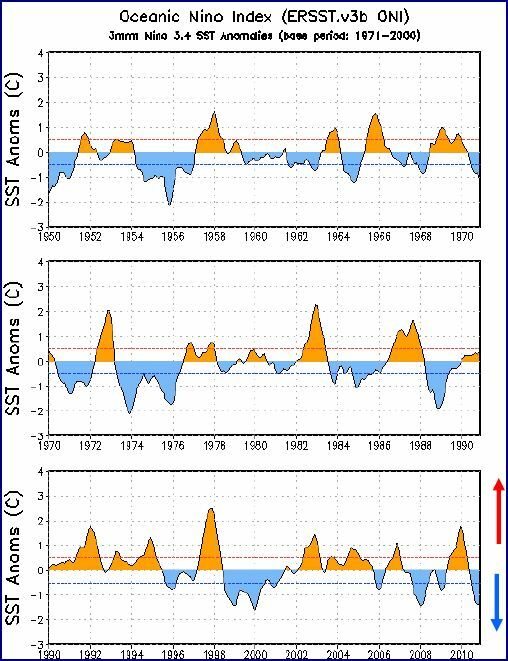 Compare the current cycle with that of the 1970-1976 in the below graphic from page 22 of NOAA’s weekly ENSO report. Blue areas are La Nina. Note that there are no signs of unusual cycles at work. La Niña is currently near its peak and is expected to persist into the Northern Hemisphere spring 2011 at a lesser intensity. Thereafter, there remains considerable uncertainty as to whether La Niña will last into the Northern Hemisphere summer (as suggested by the NCEP CFS and a few other models), or whether there will be a transition to ENSO-neutral conditions (as suggested by the CPC CON and a majority of the other models). This is a snippet of analysis about a complex subject, a simple first look. For another perspective see Prof Pielke Sr’s article “The Westerlies Explain The Recent Extreme Winter Weather, Not ‘Global Warming’“. Also note the science reference pages on the right-side menu bar. Previous Post Why do we fear the rioters in Egypt?